In this essay are preliminarly introducted the observations and the results achieved for over a year of museum communication by the Regional Archaeological Museum Antonio Salinas, subject matter of a thorough analysis being printed . In the last few years, with the complicity of social media, the Italian museum system has finally undertaken the path leading to a change: a change oriented to a two-way communication, dialogic and active  with the support of various categories of public Authority  and stakeholders . An increasing number of people and ground-up initiatives – such as #invasionidigitali – #digitalinvasions, TN –  , #svegliamuseo – #wakeupmueseum, TN  and #Museumweek  – strongly encouraged this change. Compared to the Italian and international panorama, Sicily has been so far completely lacking of uniform strategies and of policies of computerization or cultural enhancement. As a result of a range of issues – generally ascribable to the lack of political strategies of investment, to the lacunas of the Regional information Systems, to the prevailing inability to take advantage from the exclusive expertise in the field of cultural heritage and a short-sighted spending review, all issues that will be scrutinized in an appropriate occasion ,  -, institutional cultural communication communication in Sicily seems to be at a standstill, excluding some rare exceptions . The situation, in certain cases, is so serious to lead at extreme solutions such as form of self-financing from managers and staff of museum and parks in order to grant some form of communication with users, using at least social media (moreover, the situation in which the Museum Salinas finds itself). Introductory considerations are essential to understand the meaning of the revolution that we are going to introduce here. The Archaeological Museum Antonio Salinas in Palermo, one of the most important archaeological museum for vastness and prestige of the collection (with masterpieces of the Punic – Phoenician era, Classical Greek era, Etruscan, from ancient Rome and from Sicilian history from prehistory to the Middle Ages ) is, for all intents and purposes, a case of study of social museum and the intent of who writes is to present it as a virtuous example of cultural communication strategies. This Museum, giving itself a “strategic vision”, strived to recover his own public giving itself a very strong online reputation. In the essay being printed  have been analyzed: the empiric facts of this activity of communication, result of specific strategies and initiatives; numerical performance and appreciation of visitors of the different social media platforms where the Museum operates; the flow of visitors during the activities promoted; insights data from the different on-line instruments of interaction (mainly Facebook, Twitter and Youtube); the quality of the communication’s insights and the impact they produce in terms of interactions, appreciation, number of views and rate of sharing. Main characters of these strategies and results are the Museum Manager, the archaeologist Francesca Spatafora, and the Communications Manager Sandro Garrubbo. Garrubbo’s case is illustrative of how, in many cases, the regional department for Cultural Heritage of the Sicilian Region has already right inside resources that, employed in not appropriate roles, are overlooked and underused. This cataloguer with experience in advertising has become the Museum’s social media and content manager and the Salinas owes him the high visibility it has reached today. The final result, awaited for four years, is the definitive reopening of the whole exhibition area. The restoration of the historical structure hosting the Museum and the Casa dei Padri Filippini all’Olivella – House of the Oratorian Fathers in Square Olivella, TN – dating back to the XVII century, was long and complex. The wait was so long that the inhabitants of Palermo quickly forgot the Museum’s existence. In 2014, year of the bicentenary of the Museum’s foundation and centenary of the death of the great archaeologist , Antonio Salinas, whose name the Museum carries, the Museum’s staff paid specific attention to these relevant circumstances posing itself a really “garibaldina” challenge : re-earn the audience and revitalize its image. Thus is born the first slogan of the Museum: “ Closed for repairs, open for vocation”, then only “open for vocation” for the precise choice that refused, not using that word, the idea itself of closure (Fig.1). Among the numerous initiatives, with which the Salinas has brought “elsewhere” part of his collection , is noteworthy the exhibition “Gli etruschi a Palermo” – Etruscan in Palermo, TN – at the Real Albergo dei Poveri (17th October 2012; closed in June 2013, re-opened in December 2013 until the 30th June 2015), reinvigorated then through several initiatives, such as the adhesion to the national event #invasionidigitali – #digitalinvasion – in April 2014, that allowed the inhabitants to rediscover an outfitting almost forgotten and even reawakening the attention of the national press (Fig.2). Wanting to provide a numeric fact about the impact of #invasionidigitali, it could be for now quantified with a growth range of 100% between the affluence data of may 2013 and may 2014. Little events have given the Museum the opportunity to re-open, even if partially. With the exhibition “Del Museo di Palermo e del suo avvenire. Il Salinas ricorda Salinas 1914 – 2014” – Of the Museum of Palermo and his future. 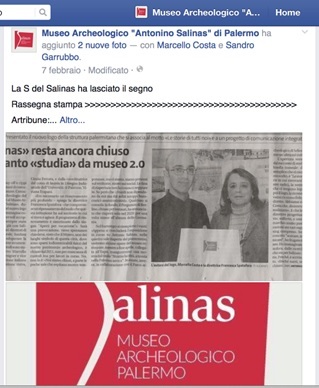 The Salinas remembers Salina, TN – (8th July 2014 – 31th January 2015), the staff decided to modernize the Museum being inspired by the lesson of absolute modernity about the concept of belonging and accessibility to the cultural heritage affirmed from its great manager. Excerpts literally stolen from the lecture the professor Salinas did during the opening ceremony of the academic year in 1873 are now “slogan” to be written on the walls and to be spread on the social media, through a new logo and a campaign ran with posts ad hoc on Facebook and Twitter and short videos inspired by the spaghetti thriller style, posted on Youtube . 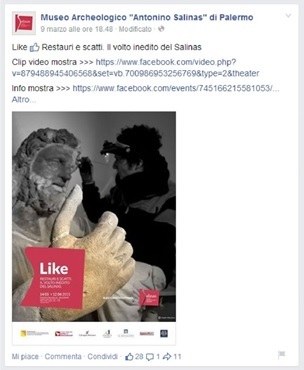 With the exhibition “LIKE – Restauri e scatti. Il volto inedito del Salinas” – Restoration and shutter click. The unknown face of the Salinas, TN – (13th March – 3th May 2015) , the meaning of which refers both to the new communication approach of the Museum both to the metaphoric freeing from the ravages of time and the signs of old restoration that put at risk the appropriate interpretation of the works of art (Fig.3), The Salinas joined the #invasionidigitali of 2015 (with a socio-educative experiment of creation of 3D reproductions of the archeological finds, whose results are being printed ). The initiative was successful as regards both of physical audience and the average growth of weekly LIKE in conjunction with the exhibition (150 instead of an average figure of 80). But how has the Salinas managed to find its own identity on the social media? In this context, we cannot describe item by item what has already been discussed on other occasions , nevertheless we can provide some significant elements of the museum’s strategy, based on keywords and ideas such as “to make curious”, “to attract”, “to involve” and “to inspire” . The attainment of these goals has been achieved thanks to strategies focused on the content planning where the clue, the reference at something close, the metaphor, the hint, the approach to the daily life, the “behind the scenes”, the use of emoticons in the posts are only a few of the instruments the museum adopted in order to create his own communication style. In addition to this there are captivating images, always combined with hashtags chosen with care and tagline that are no more a simple taxonomic description but a proper “tale”. Just an example: the well-known metope from the Temple C in Selinunte, rediscovered in 1823, portraying of Perseo severing the head of the Gorgon Medusa in the presence of Athena, has been entitled “Trio Medusa” (Fig.4) – from the name of an Italian famous comic Trio, TN. In the analysis conducted on the quality if communication, we highlighted how, abandoning the typical technical terms of the archaeological circle, new specific methods of storytelling have been taken – with a narrator’s voice telling a story with simple words – as instruments of an approach to the visitors, as well as way learning and research of meaning. Besides, this inclination towards the storytelling is at the base of the logo’s concept: S is for Salinas but also for “Stories” that create commonality. #Lestoriedituttinoi – #storiesofallofus, TN – has now become, since January 2015, the permanent hashtag of the museum’s communication . The Facebook page  has grown rapidly from the day it was opened, already full of contents, in march 2014 – to this day, 4.480 likes. Likes on Facebook and simultaneously the analysis of what the insights provide confirmed how the choice of a good title promote the curiosity and the willingness to read of users and how high and appreciate is the conversation’s quality on the Facebook user’s wall. Among the insight’s data analysed in the essay being printed , the origin of the users is worthy of attention, since just a third of the users come from Palermo and just half of the total amount can be connected to residents in Sicily, demonstrating so that not only users from all over the country have been reached but even from foreign countries. From abroad comes one-third of the Facebook’s page visitors from cities outside Sicily. Mention has been made of the Youtube channel , launched on February 21, 2014, united with Facebook, Twitter, Pinterest and Google+ and used in the best possible way to promote the museum and its events through videos especially prepared to this aim. The Twitter profile  has been opened in February 2014 and until March 2015 the Salinas was the only Sicilian institution owned by the Regional Executive present on this platform; today it counts more than 2.500 followers. 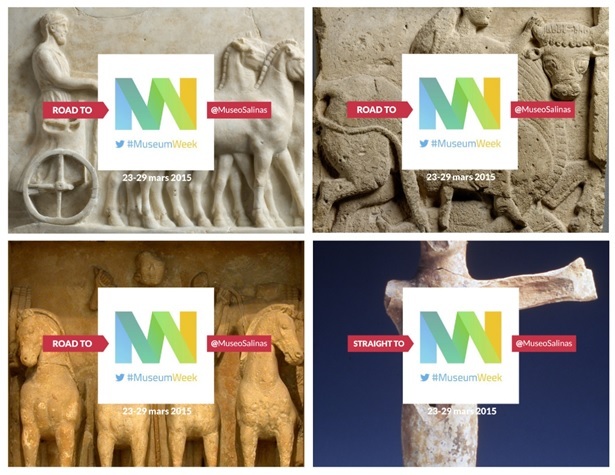 Surely a fundamental role has been played by the attendance to the international event of live tweeting #Museumweek, both in the edition 2014 (24th – 30th march) – the only among the Sicilian museums and institutions – both in the edition 2015 (23th – 29th march), achieving so a consistent number of followers (+250 after the week of #Museumweek 2015) thanks to the retweeting of several profiles from all over the world and a series of specific teasers. The Google+ profile , operating since march 2014, has passed the 17.500 views – considering here the combined Youtube videos – showing to fully understand how to use aggregation between the different social platforms. In closing, the Musem is active on Pinterest  since March 2014 and has 6 boards active, including one on the Museum treasures and one on the exhibition on Antonio Salinas. Within a year, in step with what recently suggested by the experts, the Salinas managed to develop a own web marketing cultural strategy, thanks to the stakeholder engagement, creating a own brand image, providing it of an original and recognizable brand awareness through a own style and creating a own community well active and involved. 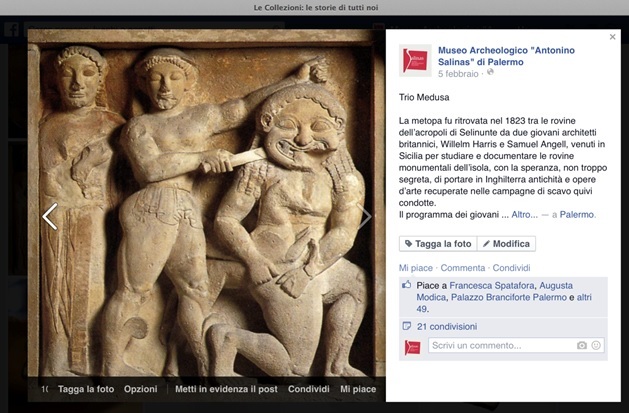 To prove the results achieved, here is provided at conclusion of this essay just an element on the fruition in the year 2014, leaving to another moment a more detailed analysis: the palermitanian Museum – officially closed – with the sole turnout to the exhibitions on the Etruscan (16.549 visitors) and on Salinas (23.255) obtains a total of 39.714 visitors, overtaking so a well-established institution such as the Archaeological Museum Paolo Orsi in Siracusa (37.481) . It is already been acknowledged that the concrete result of this new Museum approach will be clear only at the complete reopening of the Salinas. From then onwards, the challenge won’t be only to find a public and a digital reputation, but to maintain them, aligning the digital place of interaction, communication and reception with the real one and building a growing, engaged community around the Museum that can recognize itself in the cultural values supported by the Salinas. It is to be hoped, along with the Museum Salinas, that this “wind of change” can reach definitively all the others regional institutions. To do this, what is needed are “visions” and “strategies” that is exactly what has been missing so far from political decision-makers. Fig. 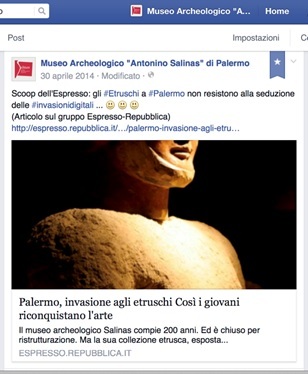 2: Post on Facebook sharing the article published on the magazine “Espresso” of Repubblica on the “Etruscan in Palermo” exhibition’s renewed visibility. On the concept of “publics” and museums’s segmentation, see finally: Bollo A., Carnelli L., Dal Pozzolo L., Seregni S., Vittor F. (2014), Il Museo e la Rete: nuovi modi di comunicare. Linee guida per una comunicazione innovativa per i musei, Venezia: Regione del Veneto (http://www.fitzcarraldo.it/ricerca/pdf/museorete_lineeguida_ricerca.pdf). On the variety of stakeholders in contact with a modern cultural institutions, see: Sibilio Parri B., Manetti, G. (2014), Il dialogo fra musei e stakeholders tramite Internet: il caso delle Sopraintendenze Speciali per il patrimonio storico, artistico ed etnoantropologico e per i Poli museali, «Il capitale culturale», n. 9, pp. 123-153 (http://riviste.unimc.it/index.php/cap-cult/article/view/714/574). On the #invasionidigitali project, see: Bonacini E., Marcucci M., Todisco F., (2014), #DIGITALINVASIONS. A bottom-up crowd example of cultural value co-creation, Proceedings of the First EAGLE International Conference 2014: Information Technologies for Epigraphy and Digital Cultural Heritage (Parigi, 29-30 settembre, 1 ottobre 2014), a cura di S. Orlandi, R. Santucci, V. Casarosa, P.M. Liuzzo, Roma: Sapienza Università Editrice (Collana Convegni, 26), pp. 265-284 (https://www.academia.edu/10144080/_DIGITALINVASIONS._A_bottom-up_crowd_example_of_cultural_value_co-creation). On the global event of the #museumweek on Twitter, see: Rist, J. (2014), #MuseumWeek: celebrating culture around Europe (https://blog.twitter.com/2014/museumweek-celebrating-culture-around-europe) e finally Pruneddu, P. (2015), Arte, cultura e Twitter, torna la #MuseumWeek (http://tg24.sky.it/tg24/spettacolo/2015/03/03/museumweek_musei_settimana_twitter_arte_social.html). The general situation of the digital cultural communication in Sicily still appears discouraging, yet analyzed in Bonacini E. (2012), La visibilit@ sul web del patrimonio culturale siciliano. Criticità e prospettive attraverso un survey on line, Catania, Maimone. It refers specifically to the model of participation of the Arca dei Suoni project, therefore see finally: Bonacini, E. (2015), Il nuovo portale di Arca dei Suoni: nuove potenzialità di partecipazione e condivisione per l’utenza remota, «Quaderno Arca dei Suoni», n. 3, Palermo: Centro Regionale per l’inventario, la catalogazione e la documentazione grafica, fotografica, aerofotografica, fotogrammetrica e audiovisiva dei beni culturali e ambientali della Regione Siciliana, pp. 35-42 (http://www.arcadeisuoni.org/index.php/download?download=15:quaderno-di-arca-dei-suoni-3). On the Museum’s history and its collections, see: Moscati S, Di Stefano C.A. (1991), Palermo, Museo Archeologico, Palermo; on the figure of Antonio Salinas and his idea of modern, see finally: Spatafora, F., Gandolfo, L. (2014), Del Museo di Palermo e del suo avvenire: Il Salinas ricorda Salinas, 1914-2014, Catalogo della mostra, Museo Archeologico Regionale Antonino Salinas, Palermo 8 luglio-4 novembre, Assessorato regionale dei beni culturali e dell’identità siciliana, Palermo, 2014, and bibliography ivi. 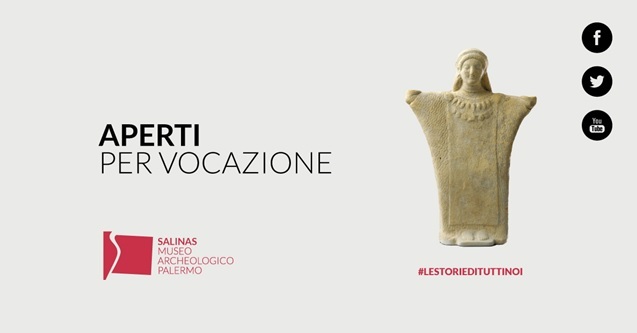 Following a cultural policy of dissemination and “restitution of identity” through the restitution of some items from the collection to the their place of origin, the Museum has organized the following exhibitions: Il Salinas a Ustica (July 26, 2014); Cinque vasi di premio. Il Salinas alla valle dei Templi di Agrigento (January 30 – March 31, 2015); Un Simposio DI#VINO. Il Salinas a Sambuca (February 12 – June 12, 2015); Tra Cipro e Sicilia preziosi ornamenti del passato (from april 3, 2015). https://www.youtube.com/watch?v=G4tWUB20s8E; https://www.youtube.com/watch?v=1z_Bsim5ris; https://www.youtube.com/watch?v=Ay7aVzdFGik; https://www.youtube.com/watch?v=1JTEjR8Qpgk; https://www.youtube.com/watch?v=Kb454Gpd2Rw; https://www.youtube.com/watch?v=wEd6e2gmi2Q; https://www.youtube.com/watch?v=YtdjnK7QiN0; https://www.youtube.com/watch?v=pzrdg1RyMy4; https://www.youtube.com/watch?v=xnK7ERDscLg. Bonacini, E., Inzerillo, L., Marcucci, M., Santagati, C., Todisco, F. (cds), 3D #DigitalInvasions: a crowdsourcing project for mobile UGC, in FURNACE, vol. 2, Cultural Heritage in Digital Age.